Remember that bowl cut everyone made fun of? Well, it’s back – but with a modern chic twist! Say hello to the wedge cut, its sophisticated sister. A wedge cut consists of soft bangs that transition gradually into soft layers. It frames your face and highlights your features beautifully. It can also be done with a sharper finish, with feathered or choppy ends, to accentuate your jawline. It is easy to maintain and even easier to style. 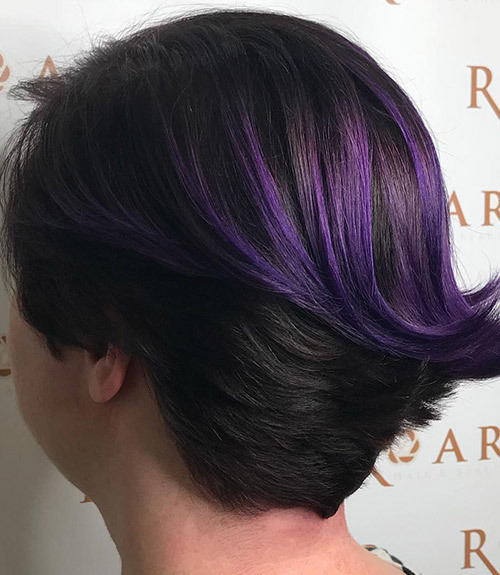 If hair is your passion, I’m sure you’ll want to do this cut on your own. However, this is one haircut that you cannot do on yourself. So, I suggest you call a friend over and follow the tutorial given below to give each other wedge haircuts. It’s a great way to get a cool haircut and bond with your friend at the same time! You will need another person whose hair you will cut and who will cut your hair. More importantly, practice on a mannequin first! 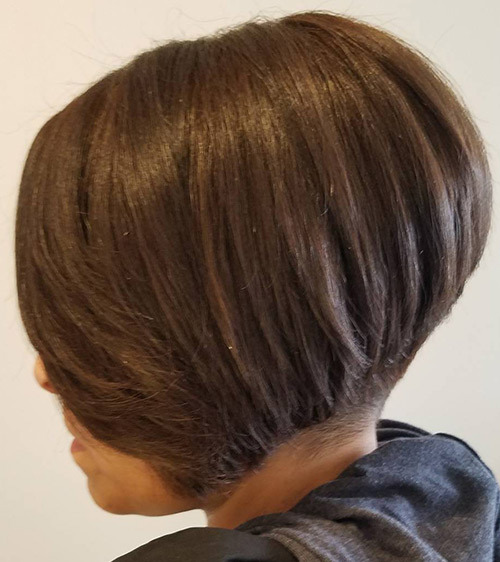 This is a basic wedge cut that is comprised of three layers. Start off small, and as you keep practicing, you’ll become a pro! Spritz on some water to dampen the hair. 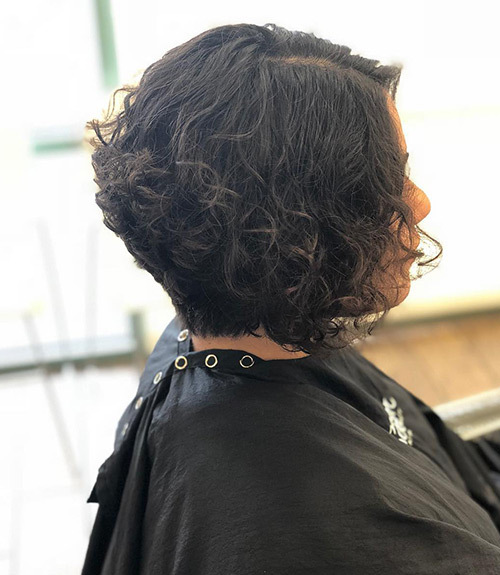 It’s always better to cut hair when it’s damp because it’s free of knots and tangles and shows the true length of the hair. Divide the hair into three sections: a top, a middle, and a bottom section. Clip up the top and middle sections, leaving the last section loose. Comb the hair in the last section and mark how long you want the hair to be. Using a fine-toothed comb, gather the hair at the center of the bottom section. Hold the hair between your index and middle fingers to keep it flat and cut at the desired length mark. Remember, the key to achieving a perfect wedge cut is to keep the bowl cut in mind. That means, much like a graduated cut, you need to cut the hair at a slight angle. 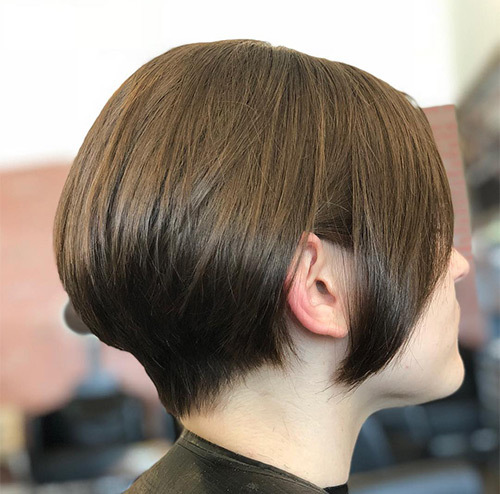 As you progress, you can try steeper angles with thinner sections of hair. 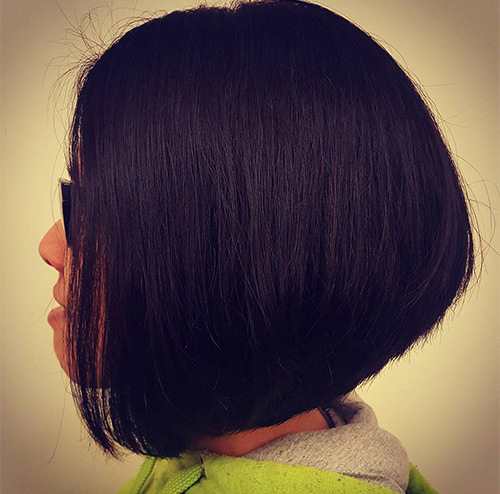 With the cut hair as reference, chop the rest of the hair in the bottom section. Unclip the middle section of hair and mark how short you want this section to be. Following the same method as before, cut the hair. Unclip the top section and comb it down. Leave out some hair in the front and sides for bangs and layers. Brush the rest of the hair and cut it to the desired length. Comb the front and sides to remove all knots. Using the point-cut method, feather the sides. Depending on the type of bangs you would like, cut your hair accordingly. Feather the bangs as well. To finish off the style, feather the ends of the three layers. Style your in waves to give it some texture and volume. Before you decide against getting a wedge cut based on the assumption that something inspired by a bowl cut can never look good, think again. These 30 chic wedge haircuts are trending right now. Check them out to get some styling inspiration! 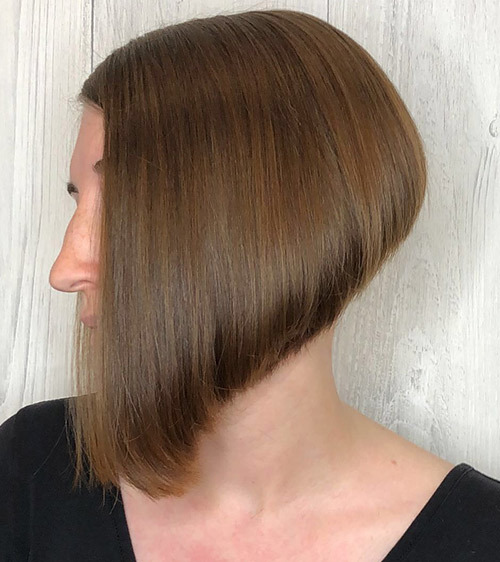 This is the wedge cut that you’ll see most women choosing. It has a well-defined back hairline and not too many layers. Opt for this wedge cut if you have a thin face. If you have a slightly round face, the layer above the jawline can make it look rounder. Edge meets vintage in this gorgeous wedge cut. This was the kind of wedge cut that was popular back in the ‘20s. A sharp, tapered hairline at the back was all the rage back then. Adding a nice A-line to your wedge cut can take your hairstyle up many notches. The wedge haircut is mostly by straight-haired women, but it can show off those stunning curls as well. If you have a wider face, keep the layers of your wedge cut just below your jawline. Much like the wedge cut, the bowl cut was also the inspiration for the A-line bob. 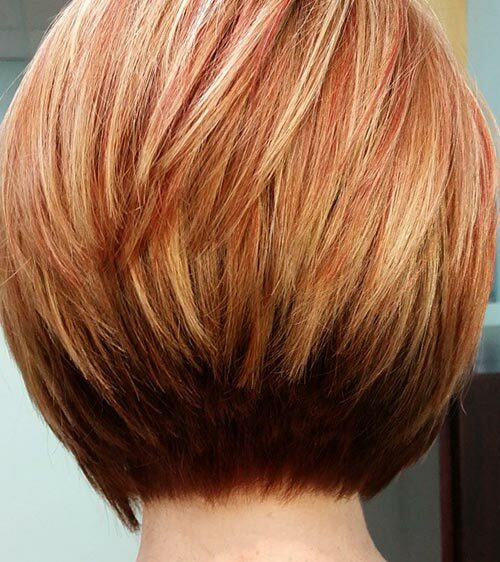 The curved hairline at the back of this wedge cut lends it an A-line effect. 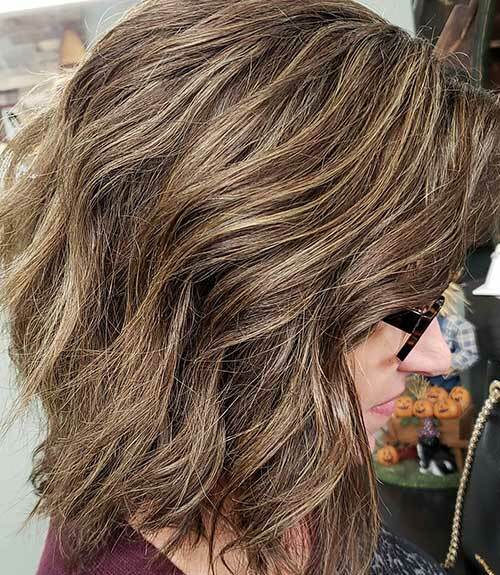 The rich brown color of this hair look lends it a luxurious touch. Wedge cuts are the best to try new colors on because of their layers. 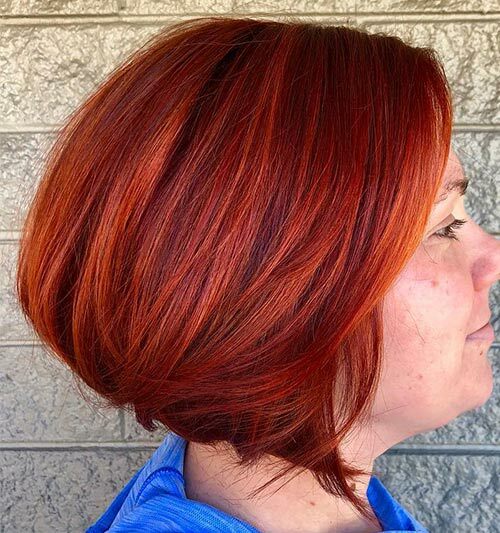 These layers showcase vibrant hair colors in all their glory. 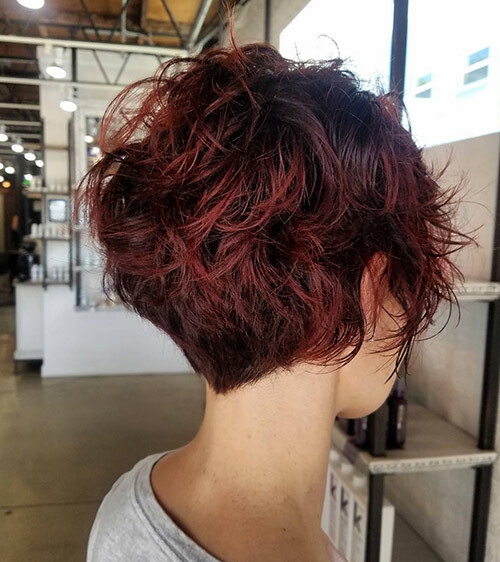 The color blend of this wedge cut is a beautiful combination of deep plum and fiery red. 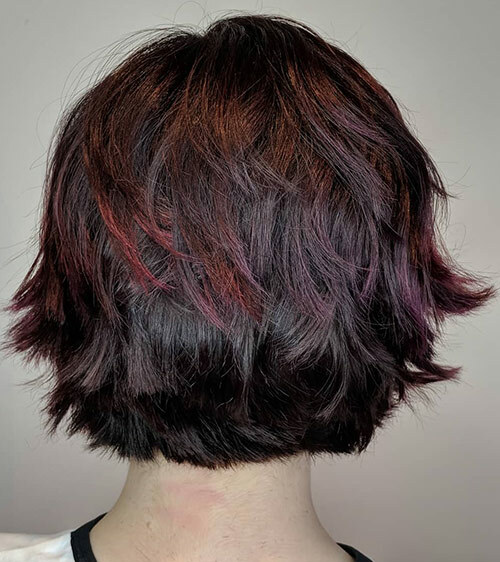 The contrast between these two colors adds tons of depth to this hair look. A layered wedge cut is best suited for the summer. 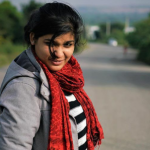 Ideally, the layers should be longer in the front and shorter at the back. 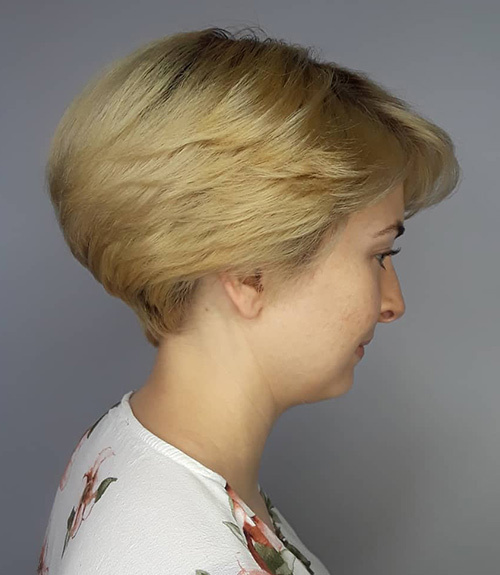 That is the trending wedge cut look of 2019. 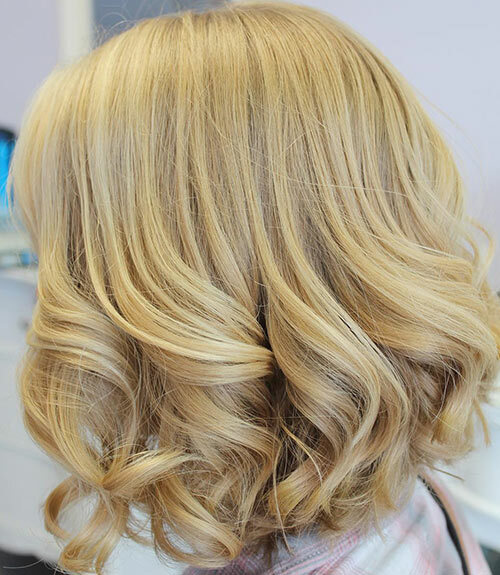 Add some soft babylights and style it in some waves to give yourself the perfect beach-ready look. 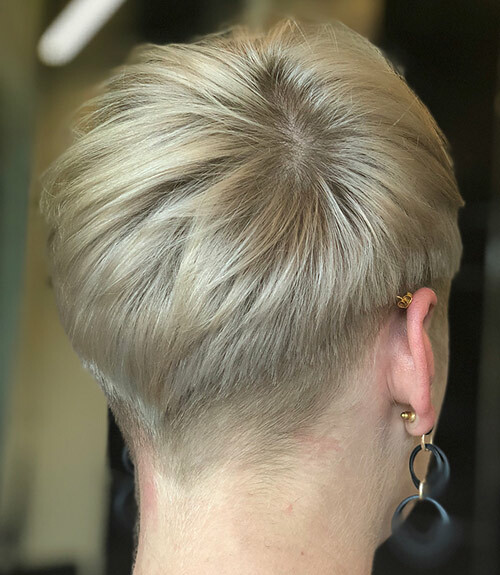 It never ceases to amaze me how a little bit of styling can completely change a hair look. Take a look at this simple wedge cut. 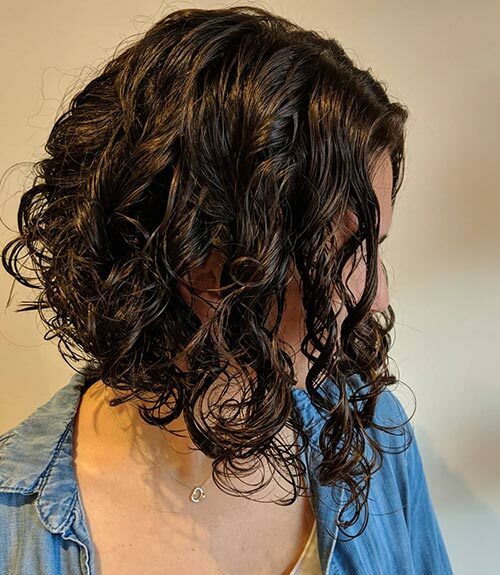 It’s a simple cut, but just adding curls at the ends spruces up the entire look. It looks understated yet beautiful. Some of us like being edgier than the rest. We like adding subtle twists to our hairstyles and clothes to stand out from the crowd. This wedge cut is a perfect example of that. The hair of this wedge cut has been swept to one side, and its ends have been turned up with the help of some hair gel. 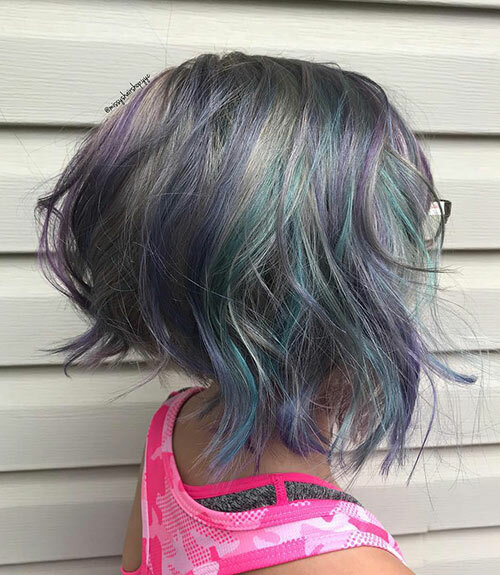 You can take this look to the next level by adding some bright violet streaks to it. All women love looking good, including moms! Just because you have kids does not mean you can’t sport a stylish haircut. This wedge cut is perfect for moms and sophisticated women. 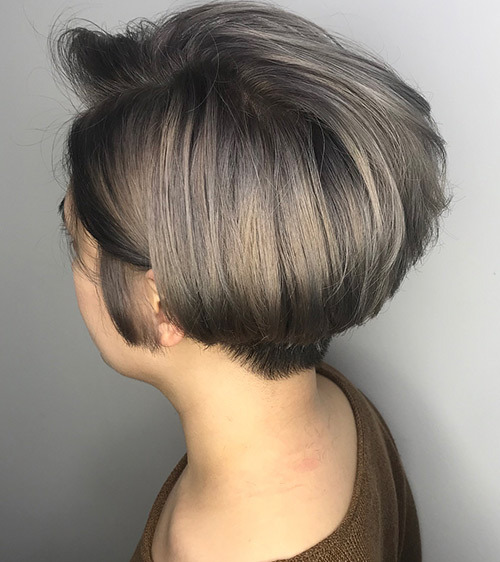 If you love short hair but don’t want a haircut that’s too edgy, look no further. 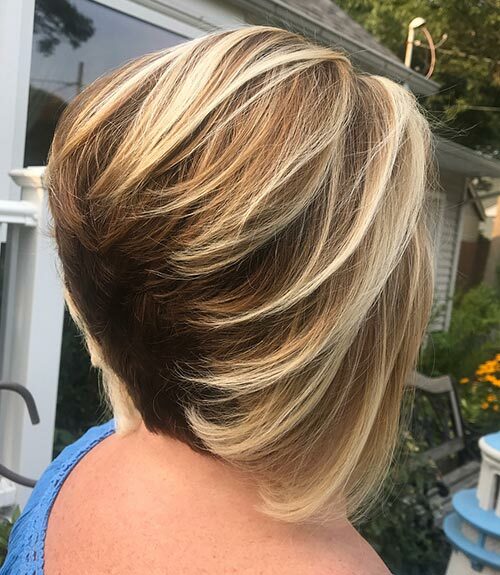 Layered softly in the front and at the sides, this wedge cut is perfect for that girl-next-door look. It’s also great for anyone who loves playing sports and wants to keep their hair off their face. Have you ever had one of those moments when you really wanted to give yourself a makeover? Well, if you have had long hair for a while, it’s time you went this wildly permed wedge cut. It looks playful and youthful! The wedge cut is perfect for flaunting those gorgeous pastel colors. Its layers accentuate your hair texture and display the hair colors beautifully. Don’t simply take my word for it, try it out and see for yourself! 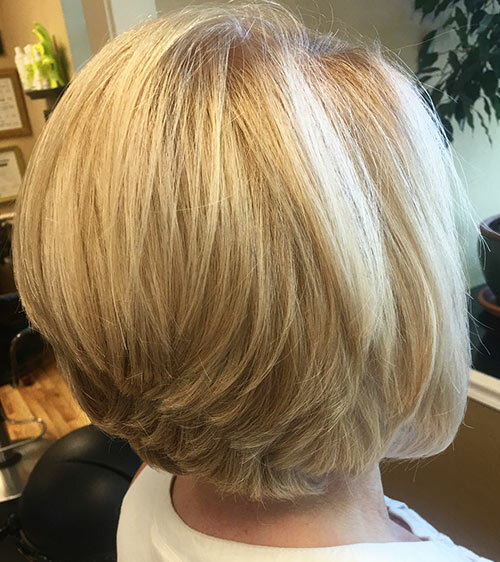 That’s right, the stacked bob can also be done up in a wedge cut. This stacked wedge cut is cut deeply at the back. 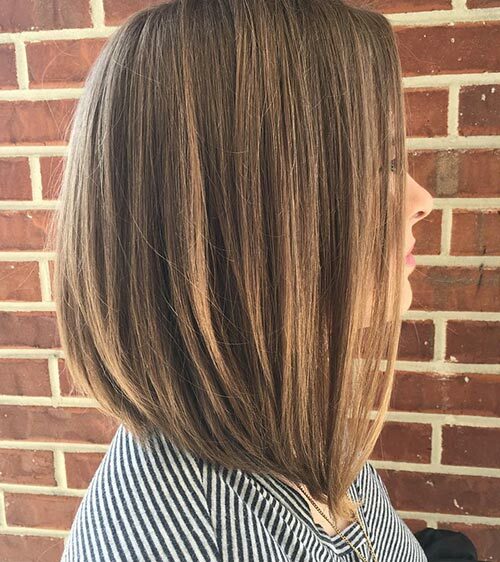 The blonde at the top and brown at the bottom make this intensely tapered bob look even better. Back in the day, men shaved their hair because they couldn’t afford to maintain long hair. Over time, that became a trend. If you don’t want a complete undercut, opt for this subtle undercut wedge cut instead. Though it’s super edgy, it’s understated enough to be sported in a professional work environment. If you’re looking for something really simple, this is it. 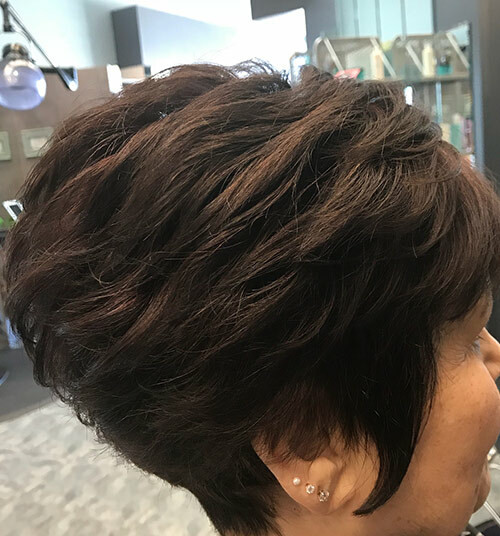 The layers of this wedge cut are cut long to add some nice texture and volume to it. If you have wide cheeks or your hair lacks volume, this is one of the best haircuts to make the most of your locks. The angled wedge cut is one of the most sought-after cuts. 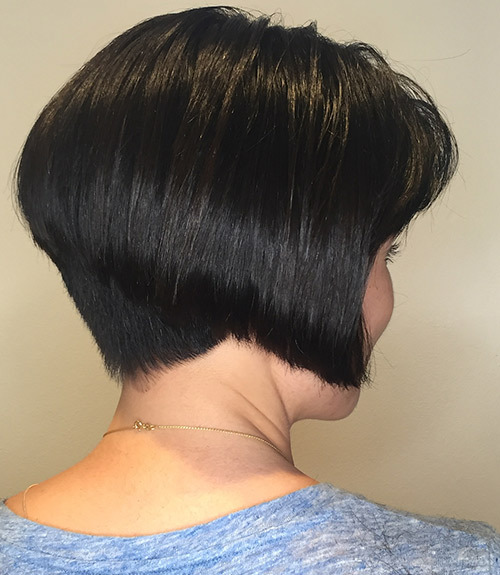 It is made up of sharp layers cut at a steep angle: long in the front and short at the back. It’s modern, uber stylish, and perfect for anyone working in a fast-paced corporate office. The wedge cut is very versatile. It can be sophisticated and mature or youthful and wild, depending on your preference. 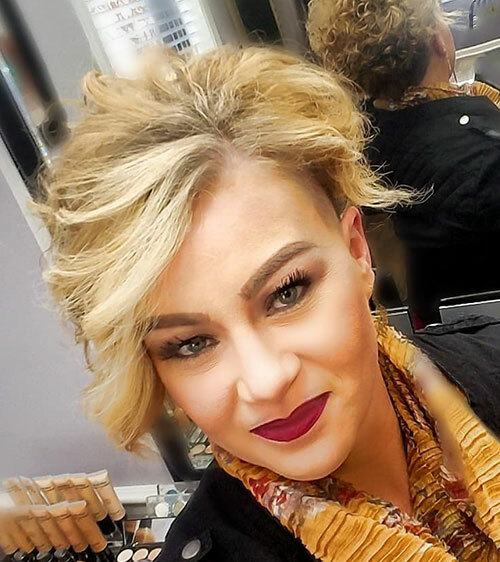 It’s no wonder that so many women love the wedge cut! The burgundy highlights of this tomboy-inspired wedge cut add a nice finishing touch to this look. Do you like your hair perfectly sculpted and in place? If so, opt for this well-defined wedge cut. Normally, you need to use a gel or mousse to style your hair perfectly. However, this wedge cut has a naturally-sculpted feel and can be styled without using many products. This haircut was big in the ‘90s. Almost every teen and young adult sported (or wanted to sport) this haircut. It’s been sported by celebrities like Kelly Clarkson. This look seems to be making a comeback now. Its flicked-out ends help frame your face. Loving yourself involves being comfortable with how you look. 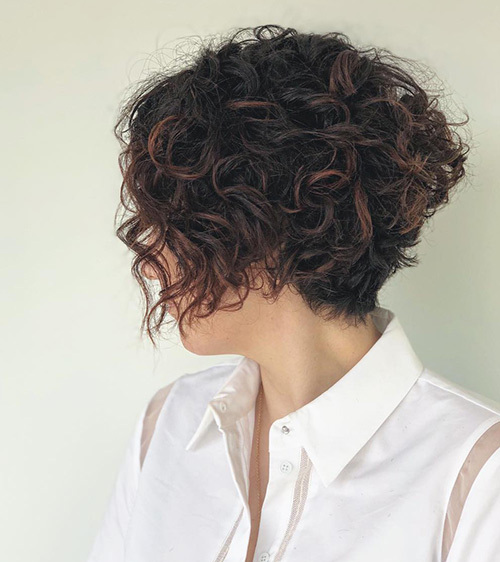 Accept your naturally curly locks and flaunt them with this playfully wild wedge cut. 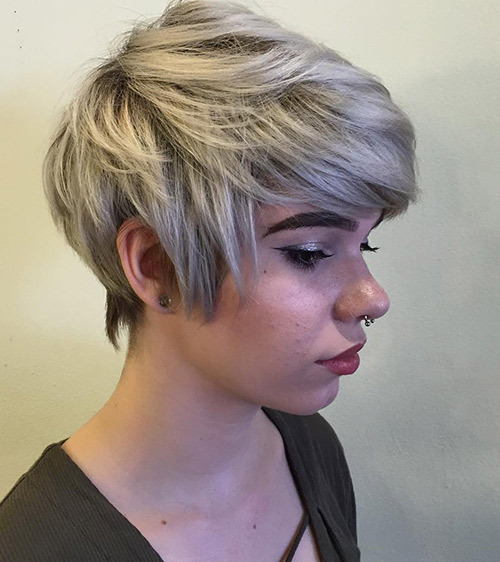 This mildly messy wedge cut is taken up a few notches with a lovely deep ash blonde hair color. The color adds a chic touch to this classic wedge cut. If you have thick hair, showcase your hair’s texture and volume with this multi-layered wedge cut. The layers are cut all over the hair to add more dimension to it. 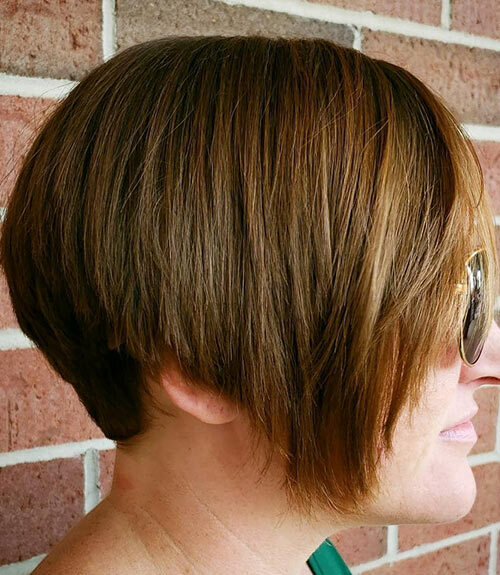 Color this cut with a dark chocolate brown shade to finish off the look. Back in the early 1900s, this was a wedge cut that most of the young women sported. Paired with a scarf or a barrette, this wedge cut was a big trend. It’s making a comeback now, and I love it! I like how different it is from most of the wedge cuts you see now. The side-swept bangs wrap up this cut wonderfully. Love the ‘80s look? Then, you’ll love this haircut. If you have thin hair, this a great way to make it look voluminous. Backcomb your wedge from the top to the down. Comb the top section of your hair for a neater look. Showing off a well-defined hairline is a growing trend right now. You don’t need to go for an undercut to achieve this look. Opt for this wedge cut instead. Let your wedge cut look messy as it adds a youthful vibe to the look. 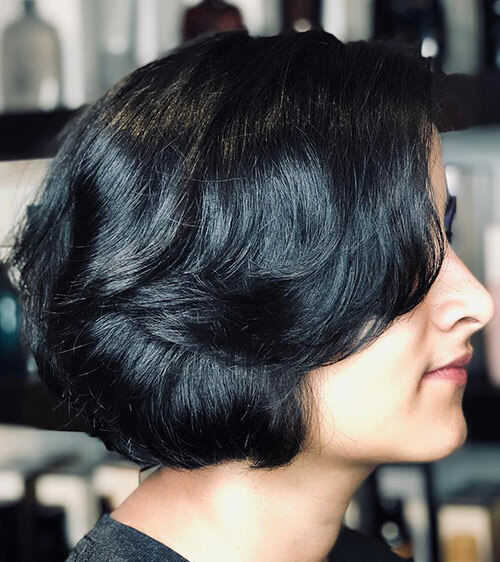 Confused whether to go for a pixie or a bob? Choose both with this modern wedge cut. The long sideburns and back to front layers make this a very chic and stylish look. Spritz on some hairspray to keep your hair in place. Most women love the angled wedge cut. This haircut is cut close to the hairline at the back to give it clear definition. Straighten your hair to create an edgy and bold hair look. If you’re not one for short hair, the wedge cut has your back. Notice how the hair is cut short at the back and long in the front, but it’s subtle and not too angled. 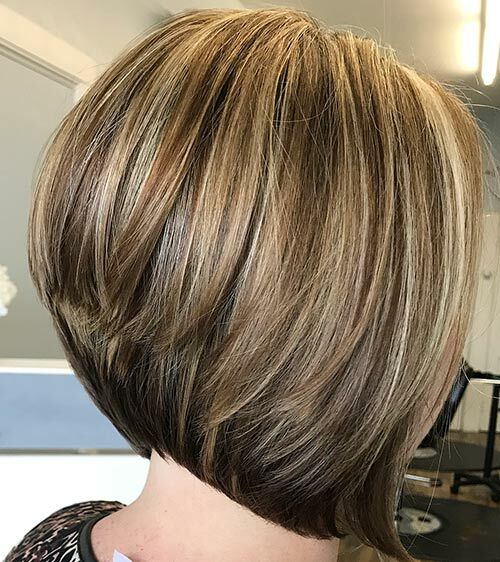 This is the perfect look for working women who want a stylish haircut while still looking mature. 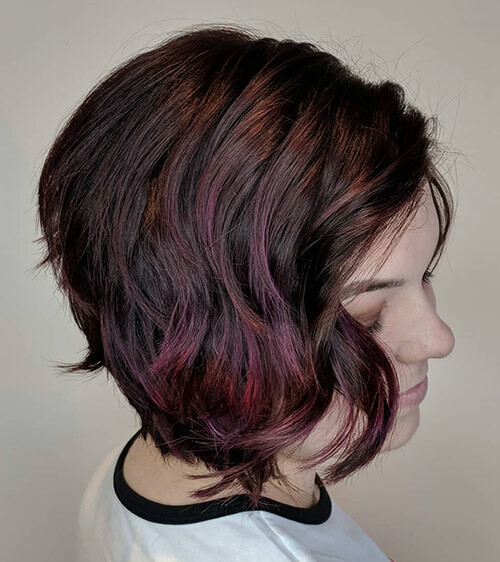 Adding color to your locks can really liven them up. Opt for colors that are similar in tone, like these shades of blonde and light ginger. This color blend is reminiscent of sunsets, long walks on the beach, and everything good in the world. In my opinion, this is one of the best wedge cuts. 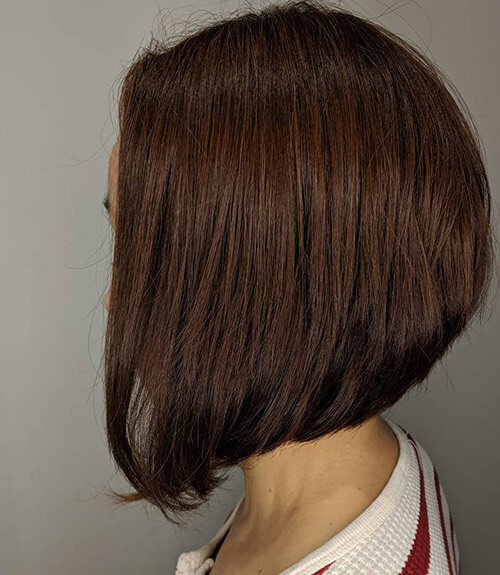 This wedged bob has the perfect ‘D’ shape along with a clean, angled finished. Keep the layers and ends soft to add definition to your face. A wedge cut is just what you need to make yourself over in the most badass way. Which one of these wedge cuts do you want to try out? Comment below and let us know!